on your mobile devices for business? Yesterday afternoon was spent reading some of my marketing material on my iPad and also researching an Android smartphone as my phone is now out of contract. All that research for Android apps will finally come into good use. I would love an iPhone but the reality as a Tech Coach is that I need to be able to speak both ‘iOS’ and ‘Android’ fluently in order to be able to help my current and future clients. I have several reading apps for both books and magazines for the iPad and it depends on where I find the material as to which app I use. Some book companies use a specific app such as Bookworld has just changed over to Kobo, then Amazon is of course the Kindle platform, iBooks is Apple’s platform. I have them all grouped in a folder entitled Books. Whenever I have to travel, an eBook is a definite advantage. I do have some of my favourite paper books that I would not be willing to part with. There is still my monthly trip to the local library and get paper books to read (this is my one ‘byte’ at a time’ philosophy and helps me to turn chill at night time- or handy for when I am going into the city on the train). Recently, when I went to New Zealand there was leadership and technology books that someone suggested I read in relation to the topics that I was presenting on, so it helped on the flight over to Auckland (and didn’t take up weight with my hand luggage). Another added benefit of eBooks is being able to enlarge the text – a bonus for those who struggle to read small text or have issues with black text on a white background (only available in certain apps). I love free eBooks. The best two places to find these are: Project Gutenberg, Project Gutenberg Australia and Librivox. These three websites are books that are no longer in the public domain (for Australia it is authors that died before 1955). Librivox is the audiobook version where volunteers have recorded these books into audiobook format. iBooks (Apple): I often use iBooks when there is eBooks (more work related) to read either free or from the Internet. If you highlight a word it comes up with three options: Define, Search and Speak. The ‘define’ function is great if you are unsure of a word and the search function looks thru the entire text and gives pages numbers on the right hand side (which you can then jump to). Accessibility options (Snapguide on making iBooks read for you) and also Day 5 of the blog challenge. These are very handy for those who are visually impaired or you could turn it into an audiobook. (see Librivox or Audible). Kindle (Amazon): I personally use the Amazon bookstore for my fiction eBooks. Often, I will double up on my favourite copies just so that if I am travelling for work (or even on holiday) then I can read them when I choose (and never loose a page). It has the most competitive prices and has the widest selection. I do love being able to change the backgrounds with the options of ‘white’, ‘sepia’ or ‘black. I find the last option (black) with white text (night time mode) is a must especially if you are reading at night time (with no lights) and some prefer this as a personal preference. The ability to also change the font of the text and how the text is spaced is also a bonus with this app. Kobo: Recently Bookworld (a division of Penguin) has joined forces with the ‘Kobo’ eBook platform to provide a greater selection of eBooks. It also has the features of highlighting and changing text. Nook (Barnes and Noble) is another eBook platform. For me, it’s finding the cheapest book and then finding out which platform I can get it on (not all authors publish to every eBook platform). Audible: Audible is an audiobook platform (powered by Amazon) and has iOS, Android, Windows and Blackberry apps. I used to love listening to audiobooks when driving long distances or when I had difficulty focusing on text. Sometimes audiobooks are also great for motivational, leadership or the latest business theories as you can listen to them anytime (pick up wherever you left off). 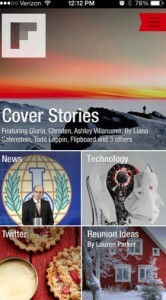 Zinio (Android and iOS) is a digital magazine store app (free) that includes over 5,000 magazines. What I love about ‘tech magazines’ or even ones like my favourite Donna Hay is the extra content such as video or other ‘interactive’ features. Although there is nothing better than buying a magazine just before boarding a flight and flicking thru it (sometimes you just have to have that sensory need to feel paper). Scribd (Android and iOS) includes the World’s largest library as it has both 40 million free books and documents that have been uploaded by users. It also has the added benefit of publishing your own documents up to the Scribd platform. Download the free app to get access to short stories, study guides and academic papers. There is a fee of $8.99 a month which gives you access to unlimited books and new releases. Flipboard: (Android and iOS) is where you can create and curate (collect) your own content into a magazine layout. I often use Flipboard with my Twitter and Facebook feeds as it’s much easier to read. 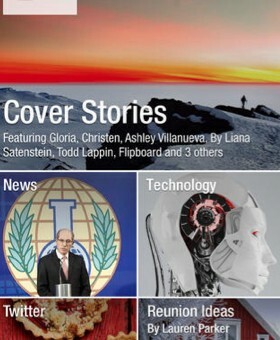 Some people curate specialist topics that interest them and then share with everyone in the Flipboard community. Tomorrow I will be looking at how to create your own eBooks (via your iPad/Android Device) and this is precisely what i will be doing come the end of November. For now, I am off to read some more marketing material in iBooks, until tomorrow remember always to take ‘one’ byte at a time. Click here for yesterday’s Blog Post. I read extensively on my Kobo device, which also has the Kindle app installed, for both business and pleasure. For IT books I prefer digital over paper, health news I tend to follow media releases and science journals using news apps and podcasts. I use the library portal with app “Borrow Box” (fav) on the iPad & “One Click Digital” ebooks and audio. Librivox is an awesome resource for books now in the public domain, as you mentioned. Lots of gems shared, thank you.